Although I’m not the biggest fan of traditional Chinese food, I definitely crave Chinese sweets. Chewy rice balls studded with white sesame seeds, sweet little buns filled with red bean paste, flaky egg tarts – I’m a sucker. Quality Chinese treats like this are usually reserved for when there’s a holiday, or if we visit relatives in Texas (unfortunately these two things usually coincide.) Unless we go to a restaurant, a lot of these sweets we buy from Chinese grocery stores end up tasting really processed. Like these little pineapple cakes. I craved them. So I made them. When I told my friend C– that I’d baked, he asked what I’d made. When I told him, he was in complete shock. “You… made them? ?” He didn’t seem to realize that it was possible to make snacks like that at home. As he got more and more surprised, I realized something – I can make a lot of things. And even the things I haven’t tried, I know I have the ability to make them. Lately I’ve realized that baking doesn’t feel like a hobby anymore. It’s not something I think about when I have nothing to do, it’s something I think about all the time, every day. And so I’m finally starting to wonder about baking as a real career. Of course, I don’t think I have any extraordinary talent. It’s just something I really enjoy. If I wanted to be really serious about it, I could get training. I’m still only 16 and so I have a lot to think about. Senior year I’m going to do two internships… and my heart is set on baking being one of them. Anyway, back to the recipe. The term “cake” is used loosely, as I can’t think of a better word in English. The dough for these cakes is really buttery, flaky, and super crumbly, somewhat like a tart crust. 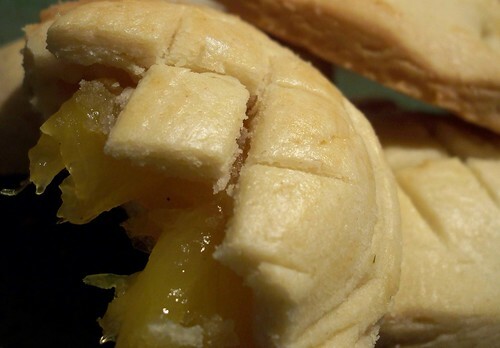 The pineapple filling is thick and almost jelly-like, and sugary sweet. I always end up spilling crumbs everywhere when I eat these and my fingers get sticky from the pineapple. Maybe it’s one of those things you have to grow up with, but I love these! Generally these are very small, maybe 1.5″ rectangles. However, I had a bit of a hard time working with the dough and couldn’t make anything that small. I ended up using an unorthodox method of shaping these, just because it was easy to work with. For filling: Heat pineapple and sugar in a small saucepan over low – medium, stirring constantly with a wooden spoon. Add more sugar to taste, the filling will be sweet. When most of the liquid is evaporated and the pineapple is thick and golden, stir in the cornstarch. Remove from heat and cool to room temperature. For dough: Preheat oven to 350 degrees. Sift together the flour, powdered sugar, salt, and cornstarch. Separately, beat the butter with an electric mixer for several minutes until softened, then mix in 2 egg yolks until well combined. Slowly stir in the flour mixture. The dough will be very crumbly. Turn out onto a cutting board and work gently until dough comes together. Roll out in two sheets. Put tablespoons of the pineapple filling on one sheet and cover with the second sheet. 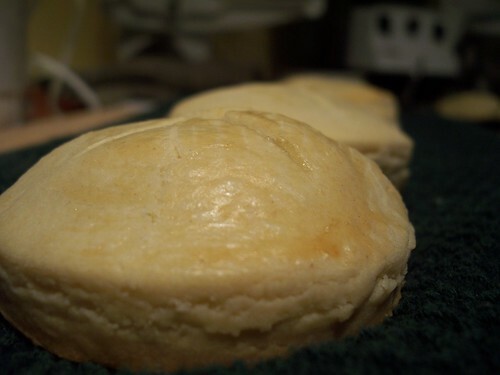 Use a cookie/biscuit cutter (or the rim of a drinking glass) to cut around each lump of filling. Brush the cakes with the remaining egg yolk and use a knife to gently cut slits on the tops. 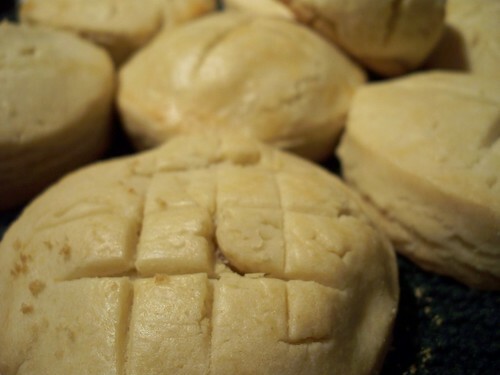 Bake cakes for 20 minutes or until bottoms are golden brown. Entry filed under: Other Treats. Tags: Asian, cake, pineapple. Hey! All your posts look really interesting and I like this post because you are considering baking as a career. I am 17 and also love cooking sooo much. It’s awesome to see another blogger–I blog some of my cooking stuff too at http://thinkitbakeit.blogspot.com. Good luck with your cooking internships! I already know where I’m going to college and it’s not a culinary school, but I’m going to keep on cooking! You’re right – I would NEVER think to make these!!! It’s too early in the morning for me to tell – are these fung lei sou?? And you’re right – with enough time, you can tackle ANYTHING. I used to read Martha Stewart Living like a novel and pick out the most daunting recipes. Cream puffs, baklava, even a 6 course murder mystery dinner. Cook on, girl! Aunt LoLo – Yes, these are fung lei sou! I really wanted to try making them at home. Shaping them into circles was much easier than the usual rectangles, so they look a bit different, but they tasted just as good. This one took me a while, though I was distracted… the dough was crumbly and the pineapple wouldn’t cook, but it happened eventually. I made six instead of twelve, and overbaked them by a couple of minutes (they looked undercooked and I don’t know how to tell!). But they still do have a nice flavor, though maybe they’re a little dry (: I think I’ll try again one day, a bit more successfully! I think that’s five done so far :D But I don’t think I’ll ever aim to complete all of your recipes anymore, now that you’ve posted elaborate cakes!~ I’ll have to be satisfied with baking complicated stuff with you! I know it’s a little weird that I’m commenting on an old post, but this jumped out at me. I’m half Chinese (my mom’s from Hong Kong) and whenever we go to visit her family, we go to Chinatown, eat tons of dim sum, and buy tons of stuff from Chinese bakeries. (Not that we do this only when we visit them, but we live in the middle of nowhere in northern New Hampshire, so there isn’t much market for that kind of thing..) I definitely wanna try these when I go home for my next school break! On another note, I also love baking. 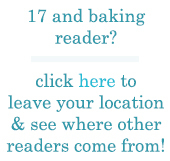 I used to be 17 and Baking as well (without the whole blog thing. I’m not that good with computers/technology). But then I turned 18… But baking is what I do when I’m stressed, bored, upset. Or happy. Basically always. I spent my entire winter break in the kitchen, making all kinds of things… My story is kind of long and confusing, but essentially I was a culinary student last year, and I attended college during my final year of high school. I left early to finish my senior year, and now am at another college studying elementary education. But I’m trying so hard to go back to my old school (Johnson & Wales in Providence, btw) to be a Baking and Pastry student. Because baking is where my passion lies. I’ve looked though your blog, and I love some of the stuff you’ve made on here, and can’t wait to try some of it (once I’m not in a dorm with no access to kitchens). I know you’ve written that you probably won’t go to culinary school or be a professional baker, but I just wanted you to know that some of your stuff is really inspiring, and I hope with practice I’ll be able to make stuff that looks as fantastic as yours! Sorry for the lengthy comment, especially the boring bits about myself, but I just wanted to let you know that I love your blog (I stumbled upon it reading Joy the Baker), and that I really love some of the stuff you’ve done. You’re an inspiration! I LOVE making my own pineapple buns! Though I’m Chinese American I’ve never had/seen a pineapple bun with a filling. Maybe it’s not available where I live in Boston with a lesser Asian population. I half the recipe and I try to weigh the dough for more even shaped buns. And if you have trouble finding baker’s ammonia, it is available online at kingarthurflour.com’s store, or I went to a local Greek supermarket and they carried it (they apparently frequently use it in baking as well). A bit pricey but just a pinch goes along way! @Jessica, you’re talking about something totally different. Feng li shu is not bread. It’s more like chewy pineapple filling encased in shortbread. I had a question though. How do you tell when the pineapple filling is ready? I’m a bit nervous that I might not be able to tell when it is the right consistency and I might overcook it >.< is it a bit more soupy when it's hot and then it gels a bit when it cools down? Also, maybe they could be made in the bottom of muffin tins.. It could help in getting the size a bit smaller. Just a thought..
Alexandra – I have to be honest, I made these so long ago that I don’t remember. I think it does gel a little bit, but not too much, so take it off the heat when it’s the proper consistency you’d want in the shortbread. Love the idea of muffin tins! I had a hard time making the cute, small pineapple cakes I’d imagined.